Bring it on, Woman! This betta be your A-game. I’m famous for never drinking water but I do sneak some in a most unusual way. Forget Mr. Drinkwell and his 360s. No offense Keith Davitt but your handmade ceramic fountains are no match for my own human drinking fountain. It’s taken TW about a hunnert years to finally document it on video. This all started 4 or 5 years ago. TW had just brushed those pathetic excuses humans call teeth. She was rinsing her mouth out when I jumped on the counter to watch her. Not only was I watching her, but I was trying to bat the water as she spat it out. She laughed so hard she practically sprayed water all over the bathroom. From then on, no matter what I’m doing or how deeply I’m sleeping, when I hear TW brushing her teeth, I run into the bathroom. TW thought the original game wasn’t very hygienic, so she started pouring fresh water into the tub for me. Check out my form! This should be an Olympic event cos I’d bring home the Gold. She’s been promising for years she was going to get a video of our game but didn’t know if she could throw the water and film it at the same time. TW will do anything to make me drink H2O; now she's my human water fountain. She pours the water and I bat it into my mouth. Aren’t I talented? See for yourself. Do you like to play in the tub or with water? You know, you are VERREH lucky she has good aim and restraint; just sayin'. Not all peeps are nice like that...Mommy. But Holy Cod, you have trained TW to a level we though was impossible in peeps...you are a GENIUS. How funny, CK - you're batting at the water like it's a toy! I'd run away from it. Yikes me no like water particularly the stuff in the bath. You are one brave kitty. Have a marvellous Monday. That's very talented! And you're very brave, CK. We are afraid of vertical water like that. 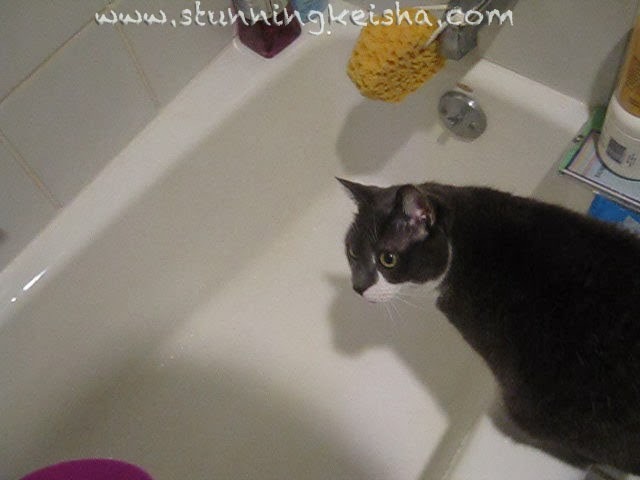 Izzy drinks from the tub faucet itself. He cries at the bathroom door or from on top of the toilet seat and i come and turn the water on as a light stream or a slightly heavy drip. This is his main way to drink water. Only very seldom will he drink out of the water bowl. Cats don't like their water next to their food because they consider that unsanitary since they bury their food in the wild and it may go bad and pollute the water. Also cats originated in the desert and don't need a lot of water if they are eating canned or fresh food. They get there water there. But if they only get dry food they will need plenty of water. What a fun game! Sadly, we do not have a tub but I do enjoy playing with water. If Mommy doesn't turn on the tap for me, I'll play with the water in the water bowls (and make a huge mess. Hahaha), much to Mommy's annoyance. OMC, CK! You are just SO adorable and unique! What a hoot! Go CK go! I din't really like the water that much, but I do like a good game of tub hockey! CK, you're turned drinking water into an olympic sport! I may have to try that with Waffles. ...after I tie his paws behind his back. OMC -= CK you are sooooooooo funny. We're laughing ourselves silly over here! The One and Only Stunning Cathy Keisha! Drinking water the CK way!! TW obviously hasn't a clue you're playing her like a strad!! MOL! You really made us laugh. Thanks! Very clever of you to train your human that way, CK! We have ours trained to turn on the faucet at the bathroom sink, and we reward her by using the 360 she's so proud of. Love playing in the water! I do the water bit while mum brushes her tooths (no spitting on me allowed). Plus after mum is done in the hot rain room, I check out the water on the bottom. What can mes say!?! CK me is gob smacked!! That is even more cool/weird than Jo-Jo sitting on Mommy's tummy when she is laying on her back reading a book in the bathtub! Thank you for all the purrs and prayers, and for starting that #pawcircle! It is all helping -- Moosey is home, and now we are just waiting for the test results so we can make some decisions. Woo-hoo! I LOVE videos of you, my darling! I do like to play in the tub, but NOT with any water around, thank you very much! You know what? A friend of the Human's used to have a big ole boy cat that sat on the sink when her friend (a guy) used the toilet, and the kitty liked to play with (NOT drink!) that stream!!! Well done CK! You seem to truly enjoy that water game....I've never been near the dreaded tub but then again I do like to play in my water bowl so I am to some extent at least INTERESTED in water! That's a fun way to drink water, CK! Jewel likes to stick her paw in the fountain and then lick the water off her paw, so she's kind of unique, too. Thank you so much for reading my blog and leaving a comment. It is so very appreciated. Wow - this is a World Premiere then? It took us 18 months to realise that Auty Peanut only drinsk filtered water!! Yes, disagreeableness *does* agree wif me--too bad Grumpy Cat already stole that name--it should have been mine!